I've been in the business of communication for a long time and one of my guiding principles is articulated by Gene Sharp in his campaign guide. "Claims and reporting should always be strictly factual", he writes. "Exaggerations and unfounded claims will undermine the credibility of the resistance". You can get away with inaccurate reporting for a long time and, if you are preaching to the converted, telling them what they want to hear, you can get away with it forever. Addressing that audience, there is often no advantage in delivering facts – people will turn away from detail they don't want to hear. In this coming referendum campaign, though, we have to secure more than 50 percent of the vote. That means we need to covert of lot of people to our way of thinking – far more than is needed in a general election campaign. And there the Sharp precept must apply: claims and reporting must be strictly factual. Accuracy is at an absolutely premium. Crucially, if we sell a false bill of goods, our target audience will not come rushing to tell us we're wrong. Most won't argue with us or even reveal their disagreement. They'll simply note the mismatch – very often intuitively. And stripped of that all-important credibility, we'll fail to convince – we won't convert the people we need to our way of thinking, and the left-wing media will have a field day. And there is nothing more calculated to burn up our credibility than the rhetoric on migration, as currently focused on the situation in Calais. Rarely, it seems, has there been so much misinformation being poured out by eurosceptics, all doubtless pleasing the converted but with a potentially devastating effect on the "no" campaign in the longer term. The heart of the issue, as one might imagine, is the degree of responsibility which can be attributed to our membership of the European Union and whether leaving the EU would solve the problem of migrants coming to the UK. The "withdrawal" question is actually easy to answer. In short, leaving the EU would not improve the position and could make it worse. The reason why there would be no difference is because asylum seekers are a matter of international law, not directly initiated by EU law. The crucial law is the 1951 UN Convention on the Treatment of Refugees and the 1967 Protocol. As long as the UK is party to these, the Government is obliged to respond to any non-nationals on its territory who demand asylum. First, it must formally assess each case individually, to determine whether the applicant's status conforms with the definition of a refugee. If they do, they must be goven leave to remain, and basic support, including food and shelter. The "contracting state" has no discretion in this matter – this is a treaty obligation and, for the UK, stands above our membership of the EU. Nor are the people seeking asylum in any normal sense "illegal" immigrants. The Convention., under Article 31, specifically prohibits refugees from being penalised for their illegal entry or stay. While that provision originally applied to those "coming directly from a territory where their life or freedom was threatened", the exemption from prosecution has since been extended by case law. It now applies to all asylum seekers, even when they have come via intermediate countries. This is applied worldwide by all contacting states, even Australia. As such, people entering the UK without authorisation, but who intend to claim asylum, tend to be called "irregular" migrants. For most practical purposes, once on UK territory, they cannot be refused entry and as long as they qualify as refugees, they cannot be deported. When it comes to migrants travelling from their point of entry into the territory of an EU Member State (often Italy or Greece) to France and thence to Calais with a view to seeking asylum in the UK, as individuals they break no law by not applying for asylum in the first country they reach. Technically, the receiver state may be in breach of the EU's Dublin Regulation, but whether they are or not is and would be unaffected by the UK's membership status. It can be presumed that some irregular migrants would seek asylum in the UK, irrespective of whether we were in the EU. 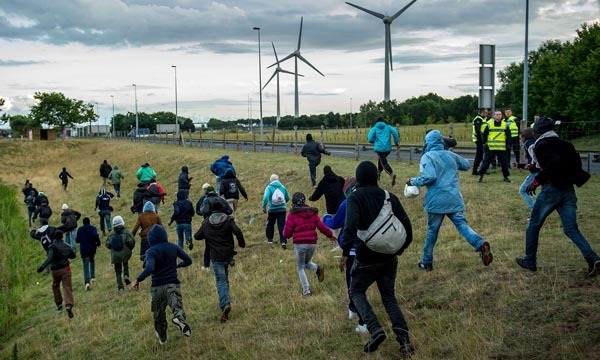 Once these migrants reach Calais, under normal circumstances, there would be nothing to stop them boarding Eurostar or a ferry and travelling to the UK, thence to demand asylum. There are not normally any controls on leaving a country – the controls are usually applied on entry. And since these migrants would then be on UK soil, they could not be refused entry as asylum seekers. However, as Booker points out in his column, by arrangement with the French government, we are allowed to station our immigration officials in Calais. They, not the French authorities, decide whether a traveller boards the transport to the UK. If at that point, migrants demand asylum, they are still on French soil. Thus, they are referred to the French authorities. Because they are not on UK soil, we have no obligations towards them. This arrangement is formalised in the Le Touquet Treaty of 2003 (with another agreement covering Eurostar), which means that there is no legal route from Calais by which migrants can enter the UK. Even the Huffington Post knows this. It observes that UK border police operate at Calais to check documents and prevent illegal migrants from reaching the country - which is why, it says, many turn to desperate measures like jumping into vans and clinging onto trains. The Le Touquet Treaty is, of course, a bilateral treaty between the UK and France. It would not be directly affected if we left the EU. However, the French government could respond to our withdrawal by pulling out of this treaty and opening the gates of the ferry terminal. It could then allow migrants free passage, whence we could be confronted by hundreds of thousands of asylum seekers, with no option but to let them in. Whichever way this is cut, there are no grounds for arguing that the EU is directly responsible for the situation in Calais. In fact, there is a tenable case that the Le Touquet Treaty, jointly agreed between France and the UK is at fault. Without it, we would simply have the migrants passing straight through, like any other passengers. To keep this issue on an even kilter, Eurosceptics should stop pretending that the EU is to blame. And people like Nigel Farage should get their facts right. These migrants are not illegal immigrants. Furthermore, anyone associated with the "no" campaign should avoid trying to elide the EU's freedom of movement provisions with asylum seeking (although it is valid to make an indirect link). Instead, they should acknowledge that at the heart of the problem lies the 1951 Convention and the 1967 Protocol, which is not affected by EU membership in the sense that it would cease to apply once we left. But that does not mean there is no EU involvement. Within the Charter of Fundamental Rights, incorporated into the EU Treaties under Lisbon, the provisions of the 1951 Convention have been enshrined in EU law. Leaving the EU does not remove our international obligations, but in order to modify or amend them, we need to leave the EU. But leaving is a necessary move. It is not sufficient in itself. There is the credible case for leaving the EU. It allows us to deal with the root of the problem - the 1951 Convention. Anything else simply damages the cause and renders the argument toxic.